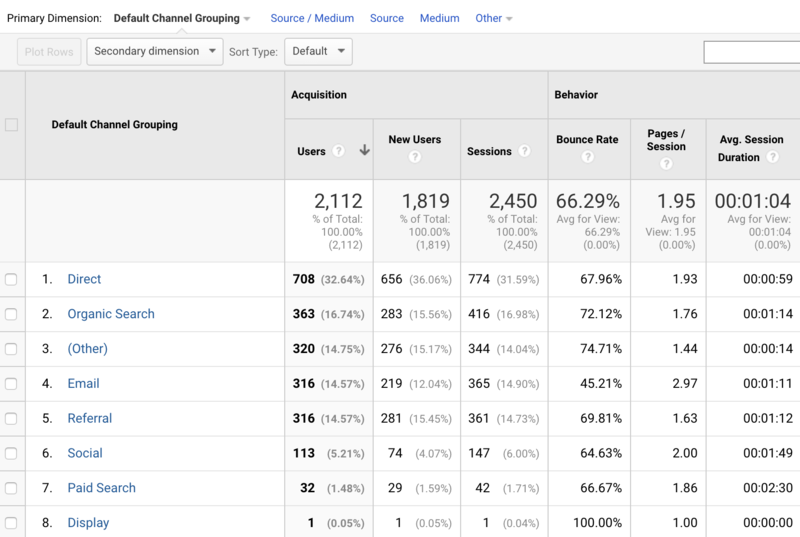 A popular resource for all marketers (and sometimes their main go-to for “the numbers”) is Google Analytics. From page views to conversions, you gain visibility into how your various marketing channels are performing. Using Sigstr and Google Analytics together makes it easy to track your success and compare your results with other channels. To ensure you're tracking Sigstr activity in the most effective way possible, follow the step-by-step instructions below. A tracking code (or ID) is required to track all visitor interactions on your website. It's important to note that the tracking ID has be on every web page that you wish to track, including the landing pages you're directing your Sigstr campaigns to. If you’re setting up Google Analytics for the first time, you'll be taken directly to the Tracking Code section after setting up your account. 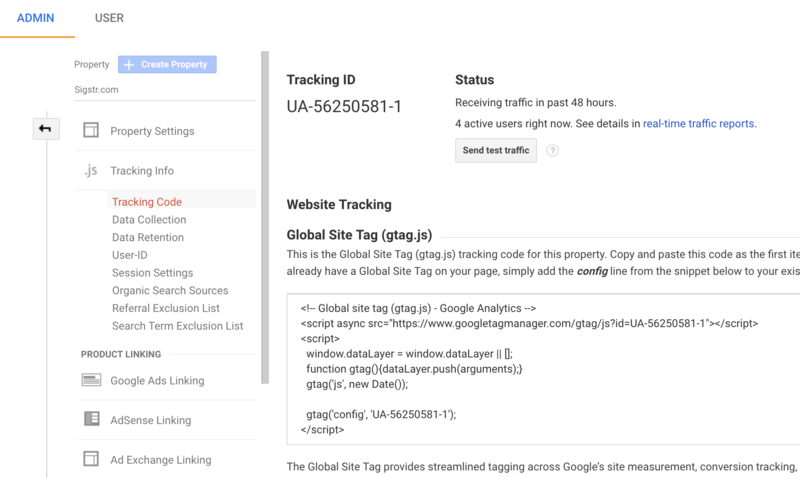 If you already have Google Analytics, navigate to Admin > Property > Tracking Info > Tracking Code. Your tracking ID can be found in the top left corner. With your tracking code in hand, you will now apply it to your website(s). There are two ways to do this. You can copy and paste the code to each web page you want to track. You just have to add the tracking code snippet right after the opening <head> tag of each page. Or, the most popular option, you can check your web host for integration options. If you’re using something like WordPress, there may be a plug-in that will automatically add the tracking code to every page. Some website builders have a specific page or field where you simply enter your tracking ID. Others — such as Blogger and Squarespace — require only your Google Analytics web property ID or account number. You can usually find this option under the Admin or Analytics section of your web hosting provider. 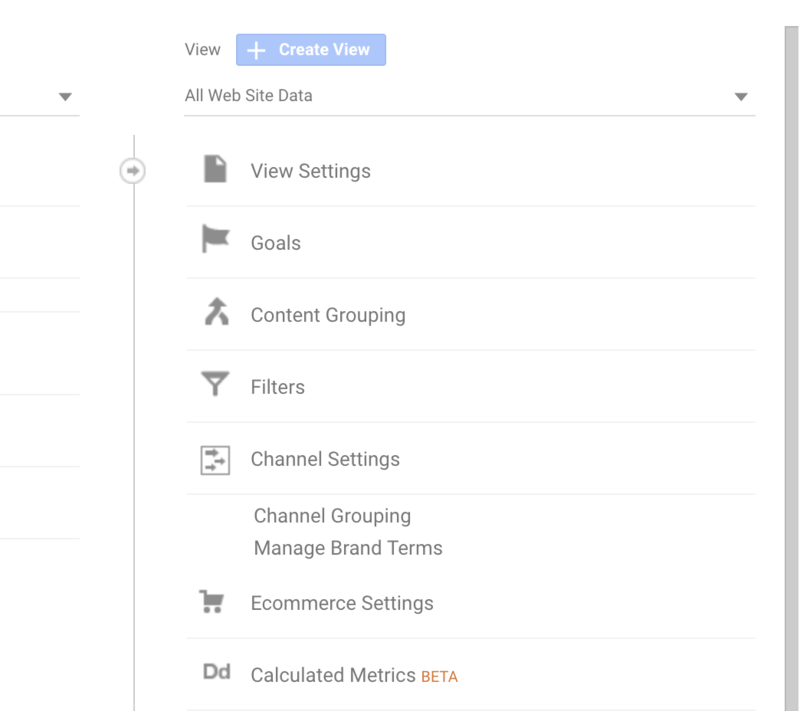 Based on the conversions that matter most to your business, you will need to create one or more goal conversions within Google Analytics. 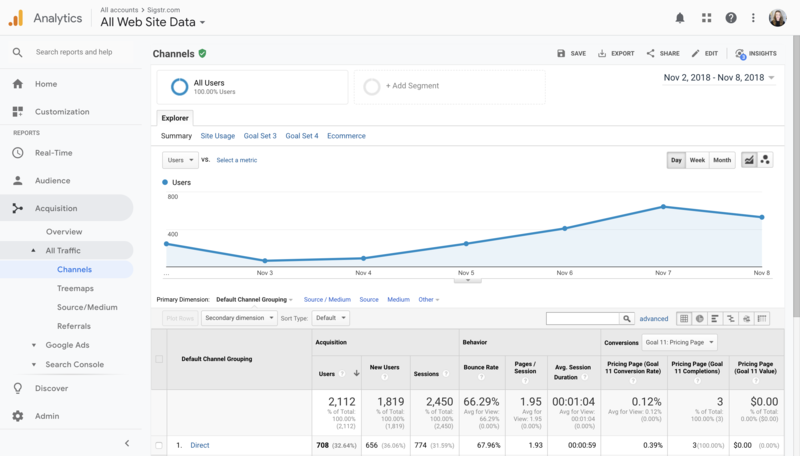 Goal conversions aren’t required, and without them, you can still see how many sessions or views are generated from a specific source, like Sigstr. However, if you’d like to see how your traffic is converting, setting up a goal conversion is necessary. 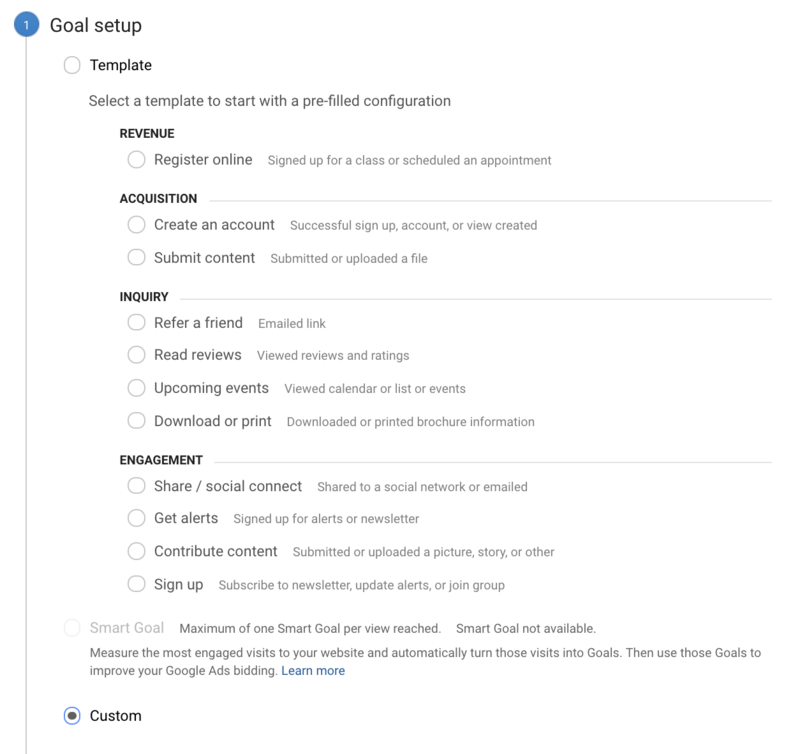 To set up a conversion goal, follow the steps below. Click New Goal and then select Custom. Destination: Treats a pageview or screenview as a conversion. Duration: Treats time spent on a page as a conversion. 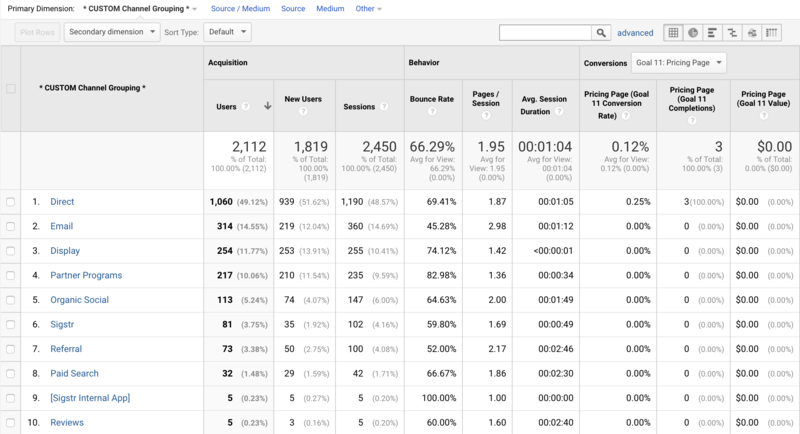 Pages/Screens per session: Measures the number of pageviews per session as a conversion. Event: Treats user interaction like a button click, video play, or ebook download as a conversion. If you're not sure which goal type to use, we recommend Destination. Most Sigstr campaigns are linked to landing pages with form fills. In the instance of a form fill, most visitors are taken to a thank you page once he/she hits submit. In this scenario, you can use the thank you page url as the destination. As a last step, consider using a Funnel. 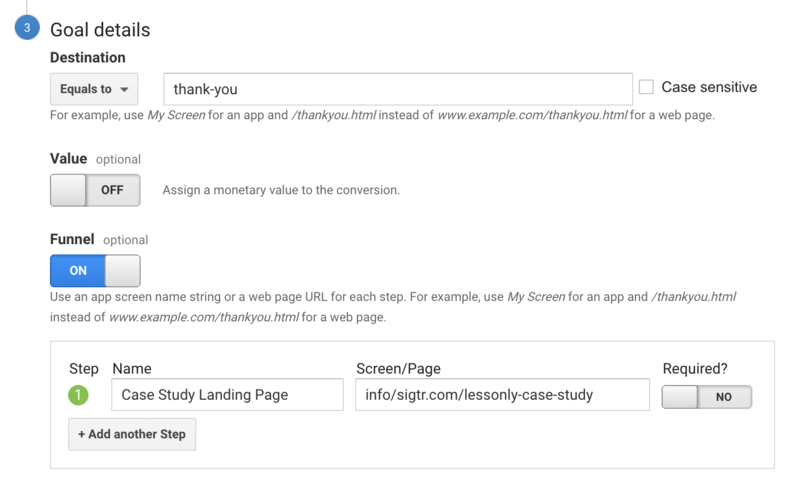 A funnel allows you to specify which landing page the form was filled out on (i.e. the navigation path). If you have a Sigstr campaign directing users to a landing page with a form fill, you can narrow your tracking down to the conversions that happen on that specific landing page. Now let the tracking begin! Follow the directions below to view Sigstr activity. Navigate to Acquisition > All Traffic > Channels. Pick your preferred time range (in the top right). Once you do, a list of top sources/mediums will then populate. In the Google Analytics default grouping, it will automatically bucket Sigstr under the Other category. Within Other, Sigstr's channel listing will automatically be named Email_Signature. This will show you the total number of sessions and new users that have been generated from your employees’ email signatures. Conversions will show up here as well. This is all possible because the Sigstr platform automatically appends UTM parameters to your email signature campaigns. To get a view into how individual campaigns are performing, use the Secondary Dimension drop-down and select Campaign. Step back and analyze the data. Recognize what’s working and what can be improved. Map your findings back to your campaign strategy and determine which ideas performed the best. 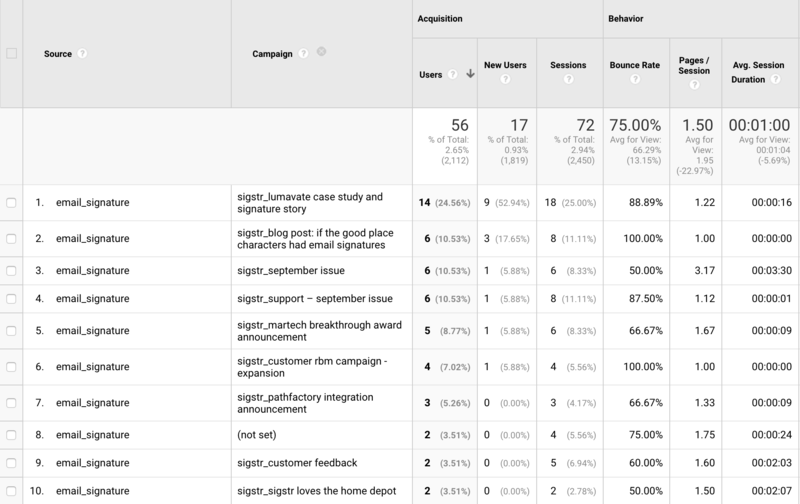 As was mentioned, Google Analytics will automatically bucket Sigstr in the Other category under Acquisition. If you would like Sigstr to show up in another section or in its own section, follow the directions below. Navigate to Admin > View > Channel Settings > Channel Grouping. Find Google's default grouping and use the drop-down to select Copy. We recommend doing this over creating a new grouping so you don't have to start from scratch. Click define a new channel and then use the rule source exactly matches email_signature. Name your new channel Sigstr and then click Done. Now when you select your new channel grouping, Sigstr traffic will be bucketed under Sigstr.